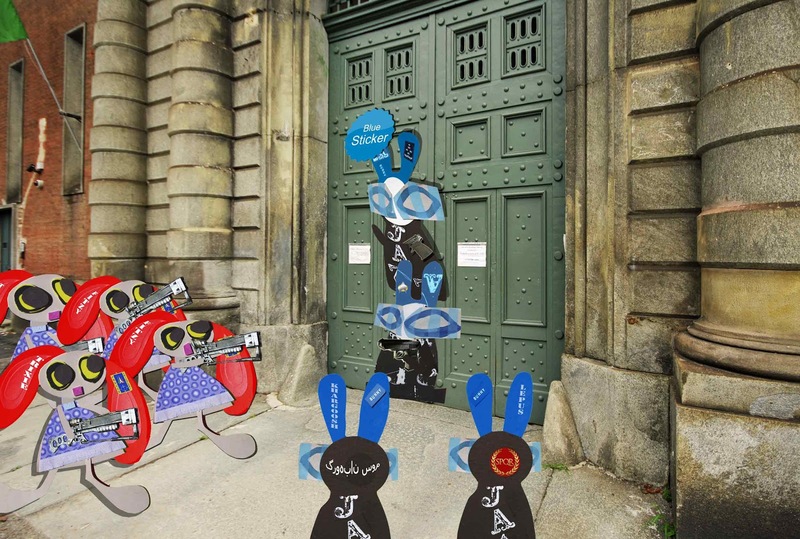 The Wabbit climbed on Wabsworth's shoulders and was about to stick the last sticker on the last war game target, when Lapinette’s team came hopping round the corner of the Old Abandoned Prison. "Grrr," he muttered as the blue sticker wafted in the wind and stuck to his paw. "Up a bit, Wabsworth," he cried. Wabsworth gave a grunt and pushed. 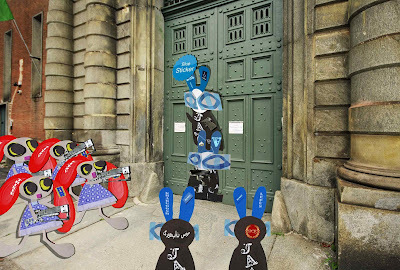 The Wabbit shot upward and attached the blue sticker, then his ear to the prison gate. "Grrr," he said again. "Paws up you lose!" said Fitzy at the front of the red team. The Wabbit waved a limp paw. "It’s paws down, I win," he said, "because our sticker is attached to the gate." "Yes indeed," said Lepus. "Stands to reason," said Khargoosh. Lapinette shook her head firmly. "No, Blue Team, the Wabbit is attached to the sticker so it doesn’t count. It’s really the Wabbit that’s stuck to the gate." "Well, the sticker should be of better quality, it won’t come off my fur," grumbled the Wabbit. But then it suddenly slipped a bit and the Wabbit slid down too. Wabsworth sagged but the Wabbit remained stuck. "It’s up to the judges now," said Wabsworth. "They'll decide who wins and who loses." "Oh no, no, no," said Lapinette. "I’m pointing my weapon at you Wabsworth, and you lose." "On the contrary, I’m pointing my weapon at you Lapinette, and it’s a standoff " said Wabsworth. "Grrr. How long will the judges take to get here?" asked the Wabbit, trying to disengage from the sticker without the slightest success. "It’ll be a while so you’re obliged to stick around," laughed Lapinette.